The Bentley Continental Flying Spur is the four-door saloon variant of the Bentley Continental GT coup�. The Bentley Continental Flying Spur was introduced in 2005 with enormous success. This car shares its platform with the Volkswagen Phaeton, and its powertrain components are related to those on the Audi A8 and S8. It was designed by the same team who produced the Continental GT and Continental GTC. The Bentley Continental Flying Spur is a large interior four-door saloon and is touted as a competitor to the Rolls-Royce Ghost. 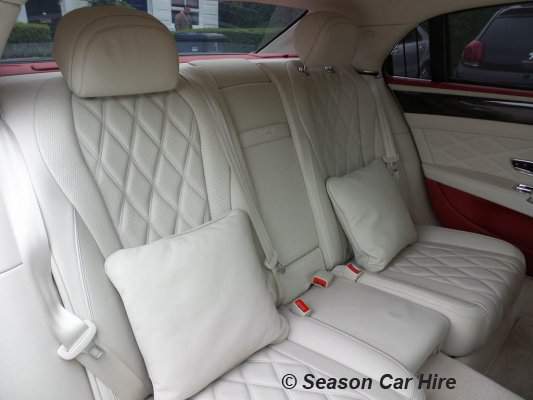 As one would expect from Bentley it is equipped with all the creature comforts one expects such as leather, Air Conditioning, Satellite navigation, Rear entertainment and plenty of room. 2016 model year vehicle are now running at circa 626 break horsepower, with better suspension for increased traction, optional carbon ceramic brakes, specific damper and stability control calibrations, new gloss-black detailing on the bodywork, unique leather stitching, gloss black radiator and window surrounds, lights, rear bumper, door handle inserts and headlight washer caps; W12 S badge on the D-pillar features with a black 'S', Beluga gloss rear diffuser and door mirrors, gloss-black front radiator matrix from Bentley Flying Spur V8 S, a dark tint on front and rear lamps, a new lower bumper insert, 21-inch 7-spoke wheel in gloss-black or new optional 21-inch Sports 5-spoke directional wheel in gloss black or a dark tint, a new fascia finish and unique stitching, a unique black engine-spin finish to the fascia and waistrails (optional satin carbon-fibre finish), a W12 S headrest emblem in contrast or blind stitching, W12 S treadplates for the front and rear, a three-spoke Sport Plus steering wheel, knurled gearshift paddles, one of 17 hide colours, unique contrast stitching to the diamond quilting, the Sport Plus steering wheel and the interior. 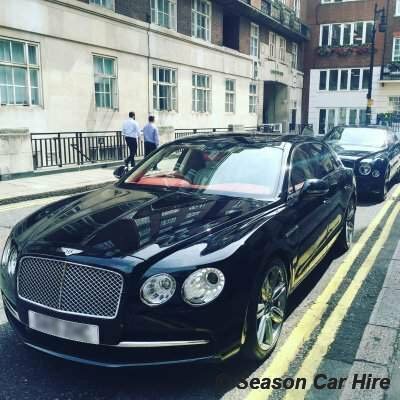 Bentley Flying Spur Hire is now available in London as part of our prestige and luxury car hire fleet. The Bentley Flying Spur is the fastest four-door luxury sedan currently in production. Hand-crafted Bentley styling is in every stitch of the leather seats and every inch of the luxurious finish, of course. Inside the cabin, four six-foot people can stretch out in comfort, in seats as relaxing as a favourite armchair. The rear load space is perfect for long weekend luggage or a couple of golf bags. In addition, there's useful storage for sunglasses and keys at the front. Driving the Bentley Flying Spur is a breeze. With the four mode choices for the air-suspension, from Comfort to Sport, you are covered for any type of driving. The car is also virtually silent at cruise speeds, allowing you to fully enjoy the amazing quality of the sound system. An 8-speed automatic gearbox coupled with all-wheel drive mean that the Flying Spur is an easy drive in all conditions. 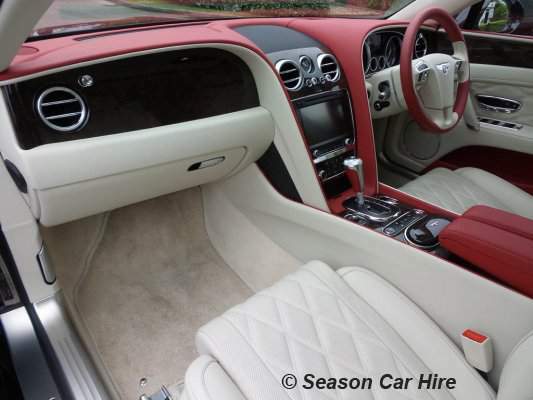 Choosing a Bentley Flying Spur to hire from Season Car Hire could be one of the best decisions you will make today. 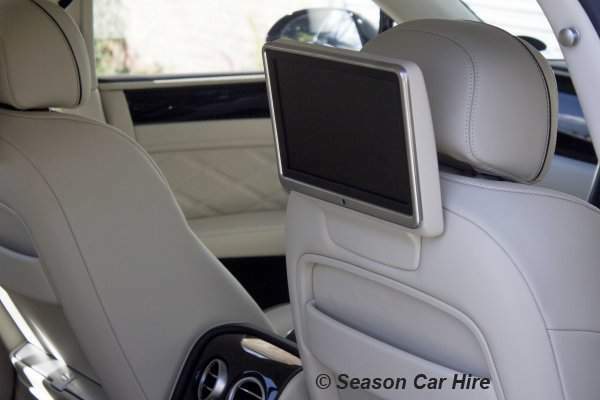 Arriving at your destination you will be the envy of all your friends as you arrive and exit the vehicle you feel at ease knowing you have arrived in absolute comfort and style. 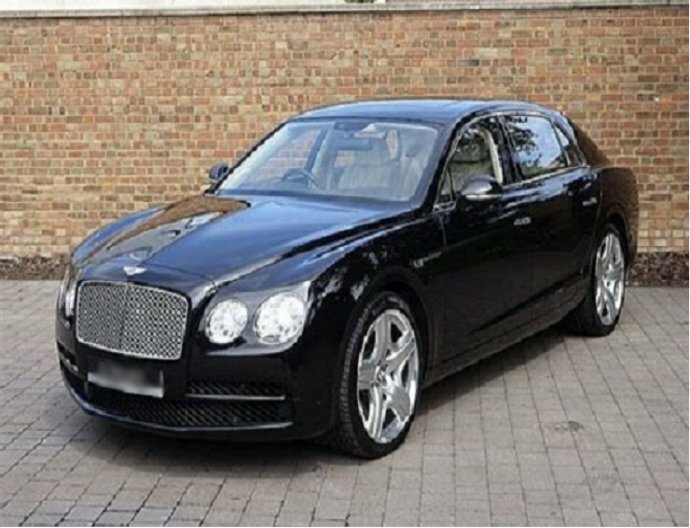 Our Bentley Flying Spur Hire is available in Black ready to hire from our convenient central London location why not take advantage of our fantastic hire rates by booking online or calling us on 02079079150 to discuss with a member of our sales team. Our sales team are extremely knowledgeable about all our cars and can help with your requirements. 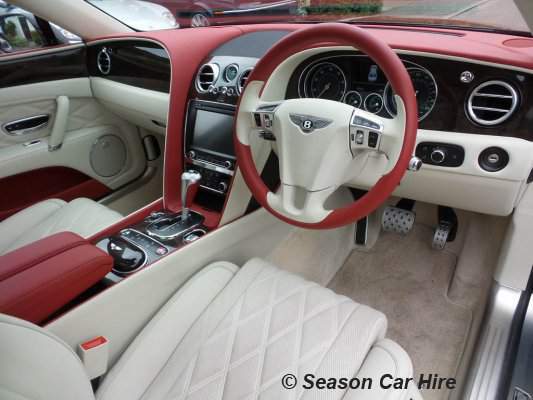 One more thing to add is that you can hire the Bentley Flying Spur Hire with a chauffeur. All our chauffeurs have extensive knowledge of London and are able to assist you with all your requirements. 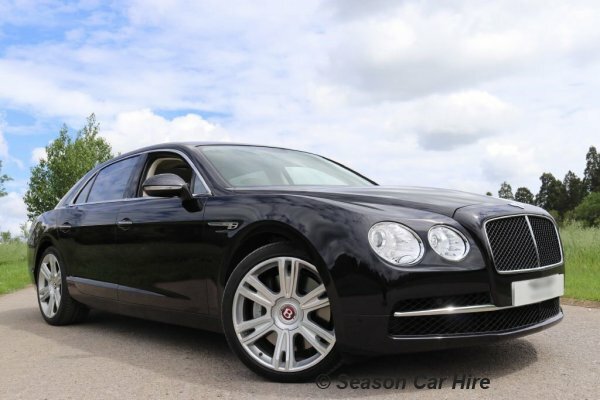 The Bentley Flying Spur is available in both the 6 litre and 4.0-litre engine sizes. the 6-litre engine is still one of the best engines available making the Bentley Flying Spur one of the quickest 4 seater saloons available. The Bentley Continental Flying Spur is the four-door saloon variant of the Bentley Continental GT coupe. The Bentley Continental Flying Spur was introduced in 2005. This car shares its platform with the Volkswagen Phaeton, and its powertrain components are related to those on the Audi A8 and S8. It was designed by the same team as produced the Continental GT and Continental GTC. Please note price has 100 miles per day, additional miles can be purchased. 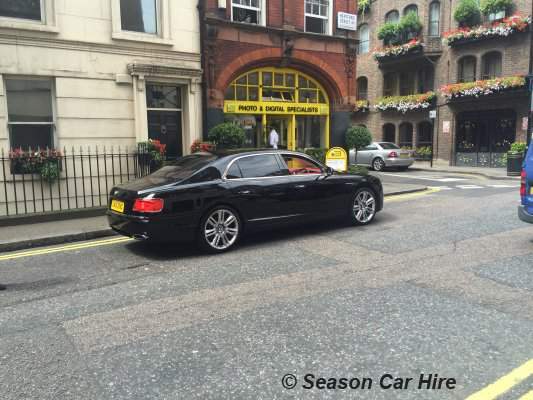 This vehicle is part of our Luxury Car Rental London fleet. 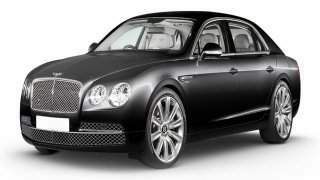 What is needed to rent a Bentley Flying Spur?